Maryland officials are looking to use micro-loans as a key tool in neighborhood revitalization, congratulating one state department on its efforts to support small business following the Freddie Gray protests. The Neighborhood BusinessWorks loan program offers gap-financing to small businesses located in areas of need, and Business Recovery Loan is an emergency program recently enacted to offer no-interest loans to small businesses affected by the riots. Since clean-up efforts had begun, DHCD and First Lady Yumi Hogan have had meetings with small business owners. Yumi Hogan is Korean-American and discussed in Korean the programs the state offers to help businesses regain their footing in the community. The department has translated loan applications into Spanish and Korean and plan to translate to other languages as needed. Funding for the Maryland Business Recovery loan program comes out of the state’s $5 million Neighborhood BusinessWorks loan program, created to support businesses that can’t fully finance their openings, renovations or expansions from private sources. To qualify for the program, business must be located in “Sustainable Communities,” areas identified by county governments as a low-income area in need of a revitalization strategy or guided investments. Businesses may be awarded up to $35,000 for micro-loans (at 0% interest) and typically up to $500,000 for larger loans (at 4% interest). “We are not replacing the private sector, we are providing a bridge for small business owners who are not able to fully finance their projects,” said Gilbert. Peabody Heights Brewery, located in the heart of Charles Village just north of downtown Baltimore near Johns Hopkins University, was approved by BPW for a maximum $500,000 loan through the Neighborhood BusinessWorks program. With state assistance, the expanding brewery plans to nearly double its jobs, partner with more brewers across the state, open a tasting room and recently installed more fermenters. Gilbert estimates the impact breweries have in Maryland is about $450 million a year. 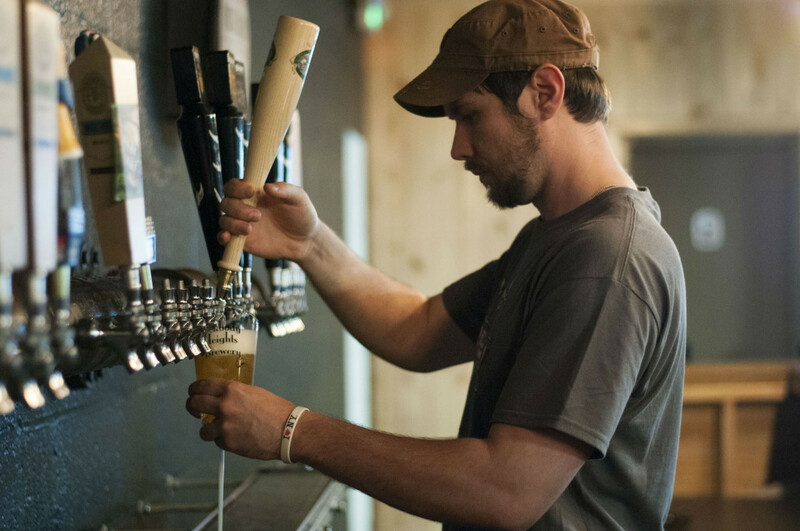 The brewery itself operates as a co-op for local craft brewers, who use the space to produce beers like Raven Beer, Public Works’ Ale, Full Tilt’s Baltimore Pale Ale and a soon-to-be released Old Oriole Park Bohemian Lager, tying into the brewery’s historic location. “It’s a great example of entrepreneurial spirit and how a little help from the state can invest and create jobs in an area that desperately needs them,” said Gov. Hogan. Brewer Grahm Crisler walks down aisle of fermenters. Peabody draws in business from brew-pubs from across the state. During a tour at the brewery this week, Mike Kolankowski, assistant general manager and brewer at Peabody, said he believes the brewing industry in Maryland has great potential for growth as these beer-focused restaurants begin to expand. According to Gilbert, Housing and Community Development Secretary Kenneth Holt hopes to expand the Neighborhood BusinessWorks Program from a $5 million program to a $50 million program in future years.